Texting My Pancreas: #GiveAllTheThings: Awareness Necklaces. Product: Your choice between a Blue Cupcake (three styles to choose from) or World Diabetes Day sterling silver pendant necklace! Info on the WDD pendant: "Handmade sterling silver necklace with a blue mother of pearl circle wire wrapped in the center, symbolizing World Diabetes Day". Info on the cupcake pendants: "Handmade light blue and white lampwork cupcake with a light blue swarovski crystal on top. This cupcake is dangling from a sterling silver chain. Why a cupcake for Diabetes awareness? Because it's the perfect size and treat for a diabetic." To enter today's contest: Leave a comment below with the word "cupcake" somewhere in there! Your comment must be timestamped before 7:00pm CST tonight, and I'll update this post shortly after that with the name of today's winner. This contest is open to everyone; not just U.S residents! (But if you win and this needs to be shipped internationally, we can't guarantee it will arrive before the 25th.) Remember that Give All The Things! 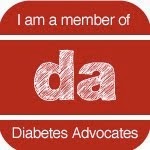 prizes are intended for people with diabetes and their caregivers. This would be amazing for my mom, who always makes me cupcakes... Although she made me fudge most recently. I would love to win this in honor of my amazing 6 year old daughter who had the most difficult day yesterday. 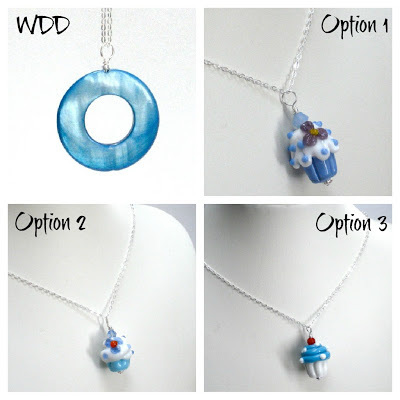 I love the cupcake necklace but would really love the WDD necklace! My daughter LOVE cupcakes! We all know that T1 kids and adults CAN eat cupcakes! I would love to give this to her to wear, she loves blue, so a blue cupcake would be perfect! My T1d daughter would love the cupcake necklace. It would look buetiful on her for blue fridays. These are such cute necklaces! I would love to have one to wear when I celebrate my 13th diaversary next year and eat my neighbor's ah-mazing cupcakes! She made me a blue cupcake for WDD this year! This is the coolest way to incorporate cupcakes into a diabetics life! Love these! We celebrated 20 years of T1D with chocolate, peanutbutter filled CUPCAKES. And the appropriate bolus of course (about 40 carbs worth). These are cool items. My T1d daughter would go crazy for the cupcake necklace. 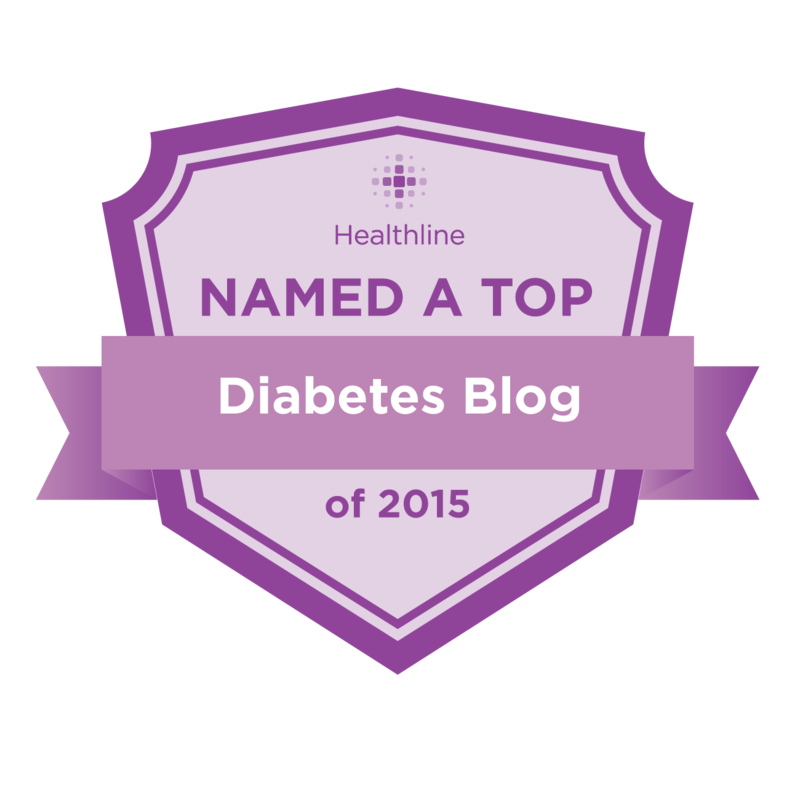 After diagnosis, I learned to bake low-carb and gluten-free desserts. I have made chocolate cupcakes with coconut flour that are only about 2g of carbs a piece! That's it! Cupcakes...what a funny symbol of the diabetes movement. Love it! "Cupcake" is one of my main food groups -- diabetes be damned! If I were to win, it would be hard to choose. The three cupcake necklaces are so sweet but I love the blue circle awareness, too. I can name that cupcake with 10 units or less. Cupcakes are nice and all, but it's ice cream that I find truly irresistible! Though the cupcake necklaces are cute I would like the WDD one. I had a cupcake at a friend's birthday party on Saturday night. It was awesome. My best friend just got diagnosed with diabetes - I would love to give her this to remind her that she still can have treats! Also because we both love cupcakes :). I love the blue circle necklace but my little cupcake would love to wear a cupcake necklace. Cupcakes are a special treat and put a huge smile on her face! The cupcakes are adorable; would love to win one! I love cupcakes and miss them so much!!! I would love this necklace. A cupcake is the perfect sweet treat! with this givaway, we can have our cupcakes and wear them too :) cheesy, I know. I already have the purple flower "cupcake" pendent ( I HEART IT) so I'm not entering the contest. But I am here to say that Cari does beautiful work and whether the winner chooses a cupcake or the pretty blue circle pendent - THE WILL LOVE IT! ...yep, just answered in Haiku. Cute cupcakes!! I want one! My T1 cupcake would love a the cupcake necklace. I love the blue circle. I love cupcakes and jewelry! Fantastic giveaway choice! I love the cupcake necklace - so cute and low carb too! What flavor is that cupcake? Well, Cupcake, the flavor is a blue raspberry with a cream cheese frosting! YUMMY! What a cool Cupcake that is! I so LOVE cupcakes! Especially vegan chocolate ones. Thanks for doing such a great giveaway. I recently ordered the WDD circle pendant and earrings and I love them so much! I would love to win one of the cupcakes! I can't see a cupcake and not think about the DOC. Cari is so prompt with feedback and orders, I was impressed by how quickly my jewelry came. Cupcake. Cupcake. Cupcake!! (But I would chose the circle:) Love them! Seriously though, I kind of like the blue circle, but I'd be happy with a cupcake... or anything that resembles something sweet that I don't have to pump insulin for. oohhh love the 1st one - pretty! I hate cupcakes. honestly. Adorable! Whether or not I win this cupcake necklace for my little cupcake, I am ordering one for her 1 year Diaversary coming up in January! YES! We have almost survived our first year!!! All of these are great. Kudos to Cari who created them! I would love to have a cupcake or WDD necklace to wear. I've been too sick for cupcakes, so one of those would be awfully nice. The cupcakes are so very fitting as we've recognised World Diabetes Day each year by handmaking and icing (then carb counting and bolusing!) some baked ones for the last few years. Yum! LOVE Cari's stuff!! I actually just placed an order for Christmas gifts! i WOULD LOVE TO HAVE THIS BEAUTIFUL NECKLACE FOR MY GRAND DAUGHTER, WHO WAS DIAGNOSED WITH TYPE 1 DIABETES. SHE LOVES TO BAKE AND ESPECIALLY CUPCAKES! SHE IS NOW 11 YEARS OLD AND WOULD LOVE IT! I already have a cupcake necklace that I love. So, having a WDD necklace would be fun! A tasty cupcake is always bolus worthy. I can't decide which is sweeter. The necklaces or cupcakes to eat! I would love a cupcake!!! Creative post . I was fascinated by the facts ! Does anyone know if my company would be able to get a blank a form document to use ?